If you have not witnessed the Adams County countryside in bloom, add it to your bucket list now. One of the most amazing natural sites to behold takes place here in Adams County each spring. Mother Nature shows off her most beautiful colors as the thousands of acres of orchards that make up the countryside bloom. Bring your camera and make your way through these 10 places to see springtime blossoms in Adams County. After being cooped up during the winter, it feels so good to get out in the fresh spring air to stretch and move your body. If golfing is your thing – there are plenty of opportunities to do so in Adams County. If you enjoy a good hike – check out Strawberry Hill or Gettysburg National Military Park. And if you are seriously craving some outdoor time, pitch a tent or bring your camper and appreciate the great outdoors at one of the Gettysburg area’s awesome campgrounds. Touring the battlefield is a must-do in Gettysburg and with the beautiful weather that we experience each spring, it is an ideal time to do so. There are several ways to take a tour and enjoy the wonderful springtime weather at the same time – hop on a bicycle, Segway or scooter or try a horseback or horse-drawn carriage tour of the battlefield. Learn about our history and catch some fresh air at the same time. Spend some time out of town and experience authentic Adams County this spring. While many of Adams County’s countryside markets are open year-round, things really get rolling in the springtime. The first fresh produce of the year becomes available – crunchy asparagus, funky rhubarb and juicy strawberries, Gettysburg’s farmers’ markets open for the year and pick-your-own season kicks off. See, smell and taste all that the countryside has to offer this spring. Whether you want to witness history coming alive, or you actually want to be a part of it, plan to experience Gettysburg’s living history as the season kicks off this spring. There are so many experiences to choose from – witness living history encampments, listen as Civil War living historians share their stories, and even dive into the living history experiences yourself. Make your way through these places to experience living history in Gettysburg this spring. Spring is the time of the year when you can enjoy Gettysburg’s culinary scene and the beautiful weather at the same time. Enjoy your date night or family night out while enjoying Gettysburg area restaurants’ outdoor dining options. There are many places to choose from – start out by making your way through this list. Spring is a wonderful time to drink in the flavors of Adams County on the Adams County Pour Tour craft beverage trail. Discover the area’s unique wines, ciders, beer and spirits, all with a spring twist. Many Pour Tour partner locations feature amazing outdoor garden and seating areas to enjoy and many release special spring inspired beverages to try. Be sure to get your Adams County Pour Tour passport stamped along the way, and be on the lookout for live music and special events to make your stops even more memorable! If you have never visited downtown Gettysburg, this spring is the time to do it. And if you have, take some time this season to rediscover, making sure that you’ve seen every gem throughout the town. Downtown Gettysburg comes alive in the spring – shop doors and windows slung open, flowers around every corner. There is so much charm to take in, and it is easy to spend an entire day walking up and down the streets, popping in every restaurant or shop that catches your eye. There are several signature events that take place in Gettysburg annually that many people have come to know and love through the years, and we welcome several of those in spring. Things kick-off with the annual Gettysburg Bluegrass Festival, May 16-19. Head to Granite Hill Camping Resort for four days of musical fun. Browse fun antique items from more than 120 dealers that set up all throughout historic downtown Gettysburg for the Gettysburg Outdoor Antique Show, May 18. Brass bands from across the Mid-Atlantic come together in Gettysburg for three days of musical fun for Gettysburg’s Brass Band Festival, June 6-8. And plan to be in one of America’s most patriotic towns for Memorial Day, where we celebrate all day with an annual parade and ceremonies, May 27. Embrace the beginning of a new season by planning something new and exciting for the months ahead. 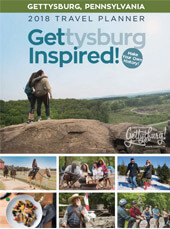 Gettysburg area offers many unique experiences that may take you out of your comfort zone, but will help you create lasting memories. Stretch it out and make some new friends at Gettysburg Goat Yoga, discover the local tastes of our area with a unique food tour, or gain a new perspective and some amazing photos with a hot air balloon ride. Will we see you here in Gettysburg this spring? Comment below and let us know what places are on your bucket list!